These Nut Free Apple Pie Bliss Bites are so good. Packed with flavour and a favourite for lunchboxes. Add all the ingredients into a food processor with the s-blade attachment. Process on high for around three minutes or until well combined and the ingredients are chopped finely. Scoop a tablespoon of the mixture and roll to make a ball in between your hands. Roll the ball lightly in the coconut to coat then roll again in your hands so that the coconut sticks to the ball. Repeat until all the mixture is used. 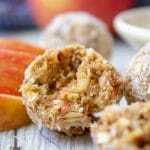 Store the bliss balls in the fridge in an airtight container. These bliss balls can be frozen. You do not need to peel the apples unless that is your preference.